1959 Cadillac Hearse - What A Way To Go! 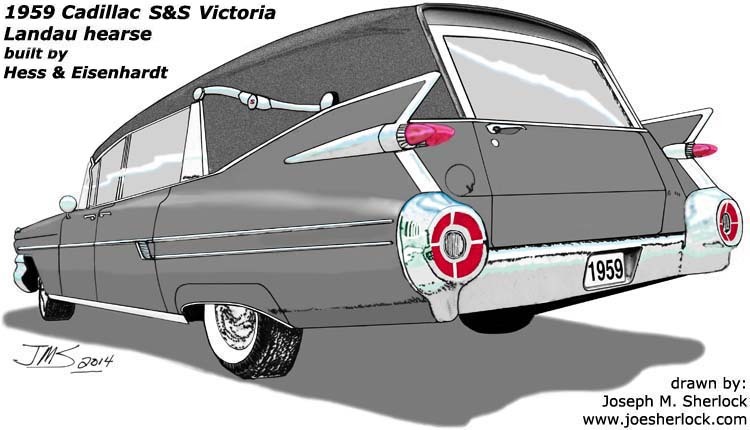 Of all the '59 Cadillac models to pick from, why draw a hearse? Well, it illustrates the difficulty of trying to integrate conservative funeral tradition with automotive space-age styling. The Space Race in car design began when General Motors found out about designer Virgil Exner's new 'Suddenly It's 1960' '57 Chrysler Corp. line-up; the GM styling department almost soiled its corporate trousers. Understandably, Cadillac had some reason to worry. In 1957, sales of the all-new, big finned Imperial more than quadrupled and came very close to Lincoln's sales figures for the year. 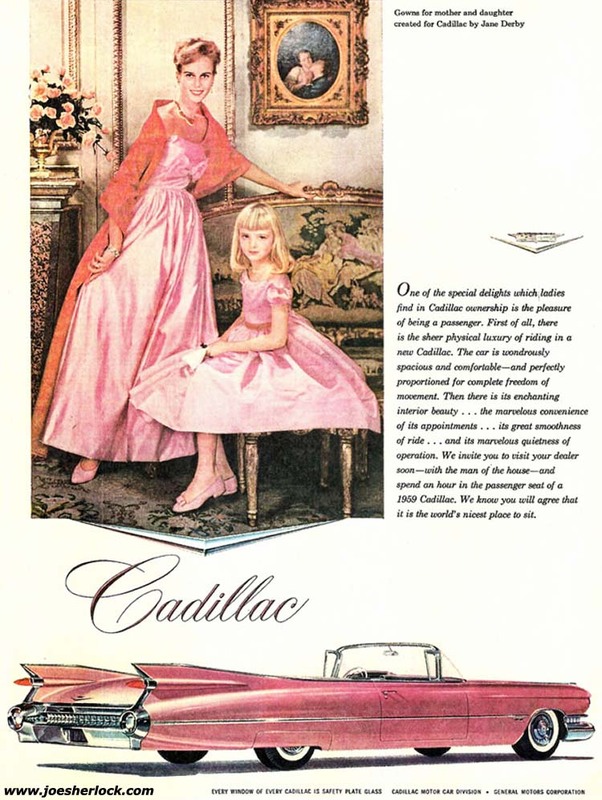 Cadillac's sales were down 5% from 1956, despite the demise of the big Packards - an event which most auto pundits thought would send conservative Packard clients in Cadillac's direction. Looking at the sales data, it appeared that Packard's loss was Imperial's gain. Postwar Cadillacs were always modern-looking automobiles but they also carried hints of the brand's historic values. But the 1959 models introduced so many style changes simultaneously - huge, soaring rocket fins, bullet taillights, a large compound wraparound windshield, thin-section rooflines and slim roof pillars - that they received much criticism from the press, design experts and others for abandoning Caddy's familiar design touchstones. There were name changes, too. The Series 62 became the Series 6200. De Villes and two-door Eldorados were moved from the Series 62 to their own series, the Series 6300 and Series 6400 respectively. Styling aside, the '59 Cadillacs were powerful cars. The V-8 was stroked to 390 cubic inches and produced 325 horsepower on regular models, 345 hp on Eldorados. One contemporary magazine reported 0-60 mph times of 10.6 seconds. Gas mileage hovered around 12 mpg on Premium fuel; top speed was clocked by one auto publication at 115 mph. The Cadillac De Ville became a distinct series for 1959, offering hardtop sedans with flat-top four-window styling and a rounded six-window roofline, plus a hardtop coupe. All '59 Cadillacs rode on a 130 inch wheelbase, except for the Fleetwood 75 limo models, which had a 150-inch wheelbase and were over 20 feet long. And the commercial chassis, on which most hearses were built; it had a 156-inch wheelbase. Hearses were produced by several coachbuilders, including Miller-Meteor, Hess & Eisenhardt, Eureka and industry-leader Superior Coach Corp. The S&S Victoria Park Row model shown in the drawing was offered by Hess & Eisenhardt (the firm that constructed JFK's SS-100-X open limousine). Hess & Eisenhardt had the reputation of building the most distinguished and expensive funeral coach in the industry. Superior's Crown Royale Landaulet was its top-of-the-line model for 1959. Superior was the largest of the hearsemakers. 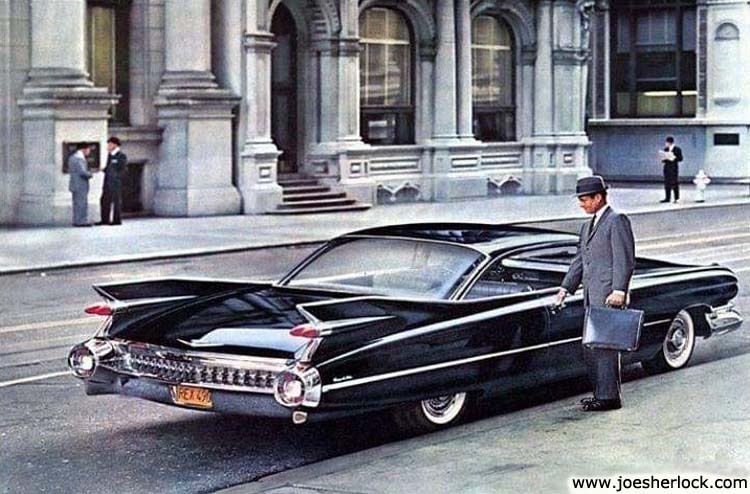 The various '59 Caddy hearse designs were a marketing success. Hearse production increased substantially in 1959; sales of funeral cars jumped 37% over 1958. Funeral directors were apparently on board with the blended, bipolar design of these '59 hearses. A total of 2,267 professional cars (hearses, ambulances and flower cars) were produced in 1959 with 2,184 on the Cadillac chassis. 1,400 factory-made Fleetwood 75 limousine models were produced. Total Cadillac production for '59 model year was also a success. Sales were 142,272 units, up 17% from recession-year 1958. Despite the generally restrained tastes of the older folks who bought such luxury brands, people seemed to embrace rather than be put off by the new Caddy's styling. Looking back, it is now apparent that American car styling had reached some preposterous zenith in 1959. Auto manufacturers realized that the extreme tailfins of the late 1950s had nowhere to go stylistically and dialed down the designs of the 1960 models. The epoch of rocket fins was coming to a close. The 1960s would evoke a cleaner, more elegant Cadillac design, as well as record sales - rising to over 200,000 by decade's end. Nevertheless, the 1959 Cadillacs - defined by those iconic fins and projectile taillights - remain the most evocative objects of 20th Century car culture and, rightly or wrongly, are considered a Fifties icon - especially when done up with a pink paint job. The iconic 1959 Cadillac has been modeled in many scales by numerous toy and model manufacturers. The yellow diecast convertible is a 1:43 scale made-in-Portugal Vitesse model; I purchased it new in 1987 for $19. The red diecast Coupe de Ville was Chinese-made in 1989 by Dinky, a brand of Matchbox Ltd. I bought it new in 1990 for $13.50. The white '59 Cadillac Eldorado Biarritz is also 1:43 scale and is part of the Franklin Mint 'Classic Cars of the Fifties' series. In 1959, Alaska became the 49th U.S. state, followed by Hawaii as the 50th a few months later. In January, Fidel Castro's revolutionaries overthrew the Batista dictatorship in Cuba. The U.S. press never thought much of Batista and didn't know what to think of the new guy. Here was an interesting man, a rabid baseball fan. The media found him fascinating. xAt the time, my high school history teacher, Joe Bloh (how could I ever forget that name), said, "Don't believe what you read. This guy is no hero; Castro's a hard-line Communist. He'll wreck what's left of Cuba." He certainly was prescient. The 1959 Kitchen Debate was a series of impromptu, contentious exchanges between then U.S. Vice President Richard Nixon and Soviet Premier Nikita Khrushchev at the opening of the American National Exhibition in Moscow. For the exhibition, an entire house was built; exhibitors claimed anyone in America could afford it. The house was filled with labor-saving and recreational devices - including a very modern kitchen - meant to represent the fruits of the capitalist American consumer market. Nixon was considered by most Americans to have won the 'debate'. In '59, Liz Taylor married Eddie Fisher. The St. Lawrence Seaway officially opened. American Airlines inaugurated the first regularly-scheduled U.S. transcontinental jet passenger service from LA to New York, using Boeing's 707. The Dow Jones Industrial Average topped 600 for the first time ever. New products included the BMC Mini automobile (Morris Mini-Minor and Austin Seven), diet drink Metrecal and, in the Fall, U.S. compact cars (Chevy Corvair, Chrysler Valiant, Ford Falcon) and toy doll sensation, Barbie. (Barbie's friend, the suspiciously-gay Ken, debuted in 1961.) In '59, the first integrated circuit was demonstrated; in the same year, the Ski-Doo snowmobile debuted. Choo-choo Charlie debuted as cartoon spokesman for Good & Plenty candy. New words included 'go-karting' and 'valet parking'. New TV shows included 'Bonanza', 'Dennis The Menace', 'Rawhide', Rod Serling's 'Twilight Zone' and 'The Untouchables', which begat a Roaring Twenties mini-revival in 1959 and '60. There were many top record hits in '59, thanks to a plethora of top-music-only radio stations: The Coasters' 'Charlie Brown', 'Venus' by Frankie Avalon, The Fleetwoods' 'Come Softly To Me', 'Smoke Gets In Your Eyes' by The Platters and Bobby Darin's 'Mack The Knife'. Fabian had his first major hit with 'Turn Me Loose'. Rocker Chuck Berry was arrested for violating the Mann Act, after transporting a 14 year-old girl across state lines "for immoral purposes." He later received prison time. February 2nd became known as 'The Day The Music Died' when rock and rollers Buddy Holly, Richie Valens and The Big Bopper were killed in the crash of a small private plane, traveling between concerts. They became rock's first martyrs. Other deaths included George C. Marshall (developer of the Marshall Plan and Nobel Peace Prize winner), Secretary of State John Foster Dulles, architect Frank Lloyd Wright, comedian Lou Costello, singer Mario Lanza, actor Errol Flynn, actor George 'Superman' Reeves, movie mogul Cecil B. DeMille and Henry Brittain, inventor of the ice-cream cone. The LA Dodgers won the World Series, beating the Chicago White Sox 4 to 2.
copyright 2014-15 - Joseph M. Sherlock - All applicable rights reserved.